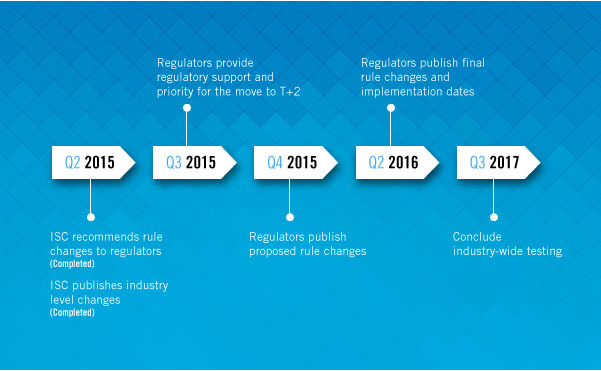 The move to a shortened settlement cycle (T+2) in the U.S. has gained strong momentum over the past several years, culminating with the release of the “Shortening the Settlement Cycle: The Move to T+2” whitepaper by the Shortened Settlement Cycle Industry Steering Committee (ISC) in June. Here’s what you need to know about T+2. Q: What does the term “T+2” refer to and who will be affected by it? A: T+2 is short for “trade date plus two days.” It refers to the amount of days between the time a trade is executed and the time it settles. Currently, the U.S. market has a settlement cycle of T+3, or trade date plus three days. Shortening the settlement cycle will affect any client that trades equities, corporate and municipal bonds and unit investment trusts (UITs) in the U.S. market. Q: When will T+2 implementation occur? Q: What are the benefits of shortening the settlement cycle? Mitigating operational and systemic risk by reducing counterparty exposure, procyclicality and liquidity requirements both from a clearing agency and member perspective. Lessen member funding requirements at the clearing agency by reducing risk exposure. Providing cost savings and efficiency as a result of the operational changes put in place to enable a shorter settlement cycle. Aligning the U.S. with international settlement cycles. European member states have already moved to T+2, Canada and Japan are actively exploring a move to T+2 and many markets in the Asia Pacific region are already on T+2 or are evaluating a move. More closely aligning mutual fund settlements with settlements of the underlying portfolio securities, thus limiting potential funding issues for large redemptions (The vast majority of mutual funds settle on a T+1 basis). The Depository Trust & Clearing Corporation (DTCC) hosted a webinar for nearly 1,200 clients globally to discuss the initiative to move to a two-day settlement cycle (T+2) in the U.S. market. The webinar, “The Latest on T+2 Settlement Cycles,” was presented by Tony Freeman, Omgeo Executive Director, Global Industry Relations, John Abel, DTCC Vice President, Settlement Services, and Matt Johnson, Omgeo Manager, EMEA Industry Relations. The panel presented an overview of the T+2 timeline and milestones in the U.S., including a preview of the industry whitepaper on shortening the settlement cycle, a review of T+2 in Europe and a look at other global shortened settlement cycle initiatives. The webinar concluded with a brief question and answer segment. Q: What is the impact for the end investor? A: According to the Securities Investor Protection Act, trades that have not yet settled are considered house trades or trades owned by the broker-dealer. They do not become client trades until settlement completes. Shortening the settlement cycle would increase the safety of the U.S. markets for end investors by reducing the exposure to a broker-dealer default prior to settlement. It will provide investors with quicker access to funds after executing a trade, but also will require them to pay for securities purchased, and deposit physical securities they are selling, in a shorter timeframe.